From a young age, it was drilled in our little minds to “reduce, reuse, recycle.” While I was mindful of these things, as I got older, I truly believed I was doing my part by simply separating plastic from cardboard, and making sure it goes to the right coloured bin before garbage day. I was under the assumption that plastic always got recycled, when in reality, that is not always the case. Rewind to December 2018. I came across a video someone posted on Facebook about plastic pollution. Either I was not listening during school or it was news to me that plastic never goes away and takes over four hundred to one thousand years to decompose. 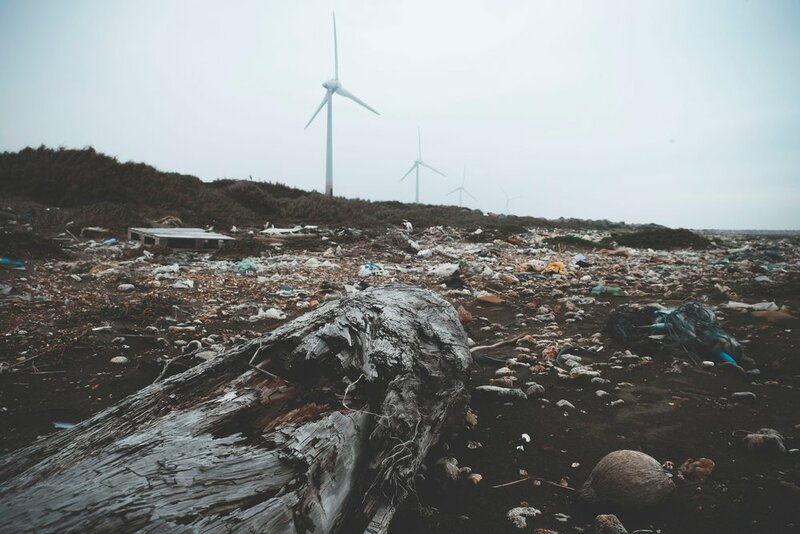 Since most plastics cannot biodegrade, it breaks down into smaller and smaller pieces that affect our landfill, oceans, our health and the overall planet. I started researching what really happens to plastic we throw away and was surprised, disappointed and amazed how much plastic surrounds our everyday lives. Our toothbrush, toothpaste, shampoo, combs, shaver, food packaging, candy rappers, lotion, contact solution and the list goes on. We produce nearly 300 million tons of plastic each year. It’s nerve racking to hear by 2050, the oceans will contain more plastic than fish. Yikes! This year I made a commitment to reduce my plastic usage and to cut down on single use plastic items. It’s a work-in-progress and not easy especially moving to a community of less than 3000 people in Nunavut, Canada. As I am constantly learning about ways to be eco-friendly, here are 7 ways you can reduce plastic pollution: Refuse, Reuse, Reduce, Recycle, Replace, Refill and Rethink. Much of the plastic we discard every year is single-use items and can be controlled by simply refusing to use them. This includes straws, plastic cutlery, plastic coffee cup lids, styrofoam and plastic take out containers. Say “no thank you,” or try other alternatives. Several stores sell reusable items such as stainless steel, paper and bamboo straws, wooden cutlery, reusable coffee cups and beeswax wraps. Don’t be afraid to simply wash and reuse plastic cups or utensils instead of tossing them out. Get creative without spending any money! For example, I use milk jugs to water my plants and old coffee tins and 11-gallon water jug as flower pots. Save peanut butter jars to store snacks, or reuse sour cream and yogurt containers to store leftovers. Since I moved to Nunavut, I have collected several plastic bags! I decided to reuse clean plastic bags I already own by keeping at least 3 inside my reusable bag and pockets in case I need it. After doing a plastic inventory of my house, I am more conscious of what I purchase and make an effort to replace plastic items with other alternatives. For instance, I use silicone or juco fabric food bags to replace single use Ziploc bags. Prior to learning about plastic pollution, I did not mind paying an extra 10 cents for a bag. Now I use my own reusable grocery bag and eco friendly produce bags with pride. Interestingly, Bangladesh is the first country to ban plastic shopping bags and so many countries are on board with acknowledging the benefits of reducing plastic. This minimizes the amount of plastic being taken to landfill sites and helps conserve the environment by properly utilizing and disposing plastic waste. Although a Recycling program was piloted in Nunavut, it was discontinued. It was too challenging to maintain with our infrastructure and too expensive to collect and ship items by air or sealift (since we do not have highways). Nevertheless, if you ever visit our “dump” also known as our version of “Canadian Tire,” you will notice an incredible amount of plastic bags surrounding the wired fence as though our landfill was decorated with papier-mâché of plastic bags. Despite not having a recycling program where we live, my fiancé and I are committed to collecting the recyclable items we use, packaging it in our luggage and disposing it properly when we head back down south. Purchase eco-friendly, plastic free products or consider making your own products from natural ingredients. I recently purchased deodorant, shampoo and conditioner from a startup company that had zero-waste options for all their products and are 100% biodegradable. I learned that sanitary pads are about 90% plastic and tampons with applicators contain plastic. As a result, I started creating my own washable menstrual sanitary pads. There are several YouTube tutorials and resources that promote “Do it Yourself (DIY)” projects. If you do not have the time or energy to create items yourself, there are several companies and organizations that sell and advocate for eco-friendly, plastic free products. Some stores allow you to bring your own glass jars or reusable containers to fill up products in bulk bins. Instead of purchasing water bottles, bring your own refillable thermos/ bottle. When you purchase new items, think about what you will do with them once you are done using it. Can it be recycled? Donated? Will it sit in a landfill? Being aware of products or companies that are transparent with their products will help you make good choices to reduce plastic waste. For instance, avoid items with “polypropylene” or “polyethylene” on ingredient lists. Use loose-leaf tea with a tea strainer instead of tea bags that are sealed with plastic. Buy boxes instead of bottles, for instance, laundry detergent comes in boxes which is easier to recycle than plastic. There is so much to learn and remarkably a lot of eco-friendly advocates that share the same vision for a sustainable, eco-friendly world. Since I became more aware of the sheer amount of packaging and plastic in the world, I found myself feeling like Sandra Bullocks in Bird Box whenever I walk around a grocery store. I feel uncomfortable seeing how much plastic is displayed, bought and used and I admit I am and was apart of this problem. However, I know I have the power to maintain my commitment to reduce my plastic usage and I hope you can join me too. I am certainly not a zero-waste individual, but I believe every difference makes a difference when we do the little things consistently. Darlene De Leon is an Occupational Therapist in Rankin Inlet, Nunavut. She enjoys traveling and finds happiness in the simplicity of life. She is passionate about indigenous health, an advocate for mental health and is determined to make a difference everywhere she goes, one smile at a time. Darlene is a life-long learner and is excited to share knowledge that would improve and empower people’s health and overall lives.